A few years ago, my colleague Rachel Bowser and I co-edited a special issue of Neo-Victorian Studies on the subject of steampunk. 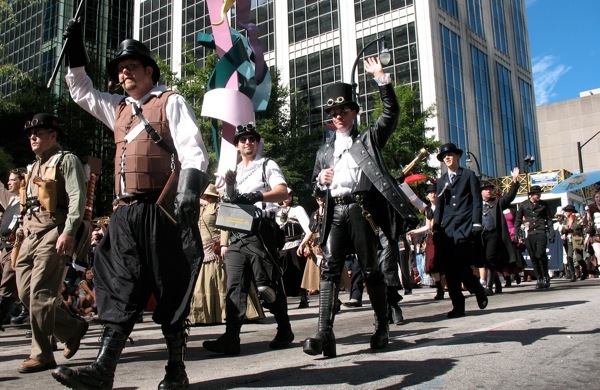 As I’m guessing you already know, steampunk is a movement fascinated by the vagaries of time as well as technology. So perhaps that’s why we find ourselves–two years later–going back to this particular imagined future. We hope to present this collection as of interest to both steampunk enthusiasts and non-specialists in the genre, as well as both academic and generalist readers. With this in mind, please submit proposals that are steeped in steampunk culture and criticism, that could be of interest to a generalist audience and that have a strong sense of the stakes of steampunk analysis for broader cultural studies. Submit 500 word proposals to Brian Croxall (b [dot] croxall [at] gmail [dot] com) and Rachel Bowser (rachel [dot] bowser [at] gmail [dot] com) by 1 October 2012. 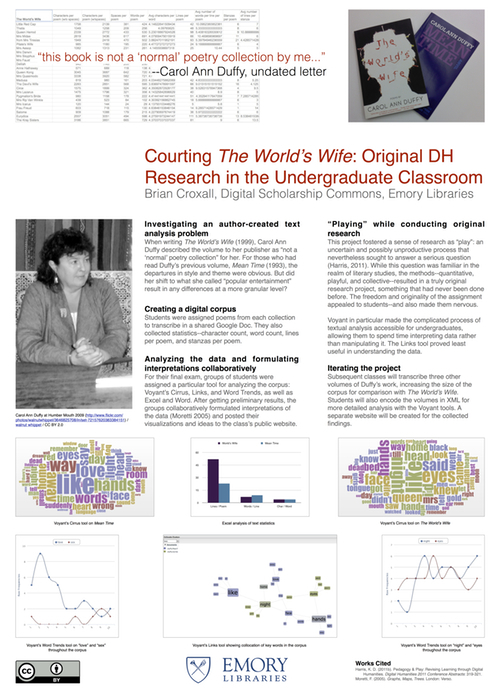 I’m quite happy to be presenting a poster at the 2012 Digital Humanities conference on a research project I tackled with my undergraduates last year in Intro to Digital Humanities. We tested two volumes of Carol Ann Duffy’s poetry for the differences that she herself felt existed in the work. First we read the two volumes and discussed them over two weeks, using traditional close reading approaches. The students explored the related poetry notebooks in our Special Collections to see how her drafting of the poems may or may not have differed. And then we started text analysis to test what we intuited from our “traditional” approach. What I think is most important in this project is that it gave the undergraduates a chance to do something new. They weren’t asked to write me a paper about an Emily Dickinson poem that five years of previous students had already analyzed. We were doing something that had never been done before, that no one could have known to test before. And that’s exciting. (If it works on grad students, why wouldn’t it work for undergrads?) Finally, I got to tell them up front that we might not even learn anything worthwhile from the process, but that we would spend 5 weeks doing it–just because. Future classes of mine will build corpora of other of Duffy’s volume, and the project will continue to grow. Who knows what we’ll know in the end…and that’s the whole point. The poster is below. Click on it for full-sized PDF. Everything is CC-BY licensed; let me know if you want original files.